A sound preparation gives you the best guaranty for a successful tour. In other words, a safe tour that fulfils al the expectations of the tour members. By planning your tour at home you have enough time to consider the possible consequences of the route you would like to follow. You can think freely of all possible alternatives that you have in case of a problem and work them out as well. This will reduce the change that things are getting out of hand. In analyzing accidents you see quite often that accidents, that could be avoided, are an accumulation of smaller problems. By being well prepared you will be more able to judge the possible consequence of each problem so you can make the right decision before it is to late. This is true for every mountaineering tour but especially important for a backcountry ski-tour. 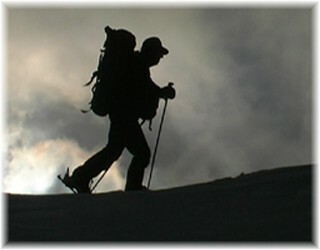 This site offers a lot of information for the independent back country skier. But before you can go out there on your own, it is better to join some organized tours (see Information > Interesting links / Organized Tours)! Once you are more experienced, it is time to follow an avalanche training course (contact your mountaineering club). Your experience and background information will allow you to create a Tour Plan. (An example of this is given for the Bündner Haute Route Graubünden.) A template can be downloaded by clicking on the Word icon below. By using this template you will save time but even then, creating a good Tour Plan is time consuming. But with a Tour Plan it is more likely that you can fulfill the tour as planned and it is also a part of the fun. Once you have created your own Tour Plan we would be very pleased to publish it on this site. Just get in contact with the webmaster. more information about how to plan a tour. In case of bad snow- or weather conditions you might wish to emigrate to a different mountain area. This could be an impulsive, not well prepared decision. So it is better to consider an alternative tour before you leave your home. See the Library for pre-cooked Tour Plans. You can use them as a starting point for planning your own tour as well. In any case, good luck with your tour.